These colorful Wooden Dominoes Sets feature Wood Domino Tiles that are packaged in heirloom-quality solid wood storage cases. Each case has handy organizing slots and can be matched to Domino Tiles by number or color. A detailed instruction booklet is also included. 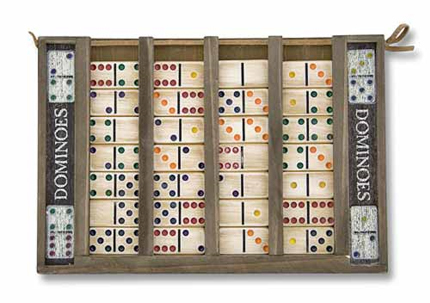 The Dominoes Set measures 1" x 8.25" x 12.25" and is recommended for players ages six and up. Feel free to browse our other Classic Games including, Checkers, Go Game Set, and our popular Pokeno Game Sets.